Almond and Pineapple Tart Recipe - Let the Baking Begin! Almond and Pineapple Tart is made of flaky Puff Pastry shell, filled with almond cream and chunks of dried pineapples, then topped with crunchy Almond Slices. It is a lot of flavors that come together in one Magical Puff Pastry Dessert Tart! This tart should go under a fancy name of Pineapple Frangipane Tart. Frangipane is a combination of almond flour, eggs, butter and sugar and where the majority of the flavor comes from in this tart. What’s this Almond and Pineapple Tart taste like? To those that have never had something like this tart let me try to explain what this tastes like. 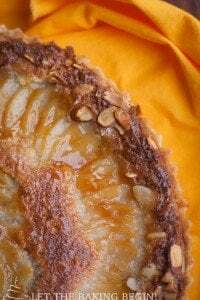 The base of the Almond Tart is flaky, while the middle of the filling is somewhat dense with almond flavor, then there are the sweet notes coming from the tropical pineapple and then the whole thing is topped off with crunchy almond flakes. This tastes nothing like any kind of pie or tart you know. 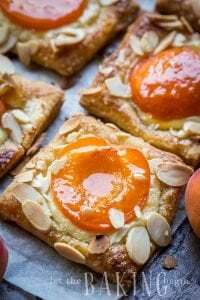 The almond filling is very unique and is the basis for many French pastries and desserts. While the homemade tart dough was not hard to make, it was a little more time-consuming than just thawing the dough, so it made sense that I would want to explore other options so to say. Previously I posted a recipe for Pear Frangipane tart that was made completely from scratch. The tart dough, filling, even the pears that topped the tart came from fresh pears that I got at the farmers market. This time around, I cut around every single corner that I could. First I saved time by using the frozen puff pastry. Second, I did not use any time consuming fruit topping, instead I went for the dried and sweetened pineapple. So, if you’re looking for something unique and delicious, this tart will fit the bill! The dried pineapples in the tart keep the tart juicy and sweet. You’ll love it! Almond Cream & Plum Tart – Gluten-Free Dessert that’s Delicious and Guilt-free! 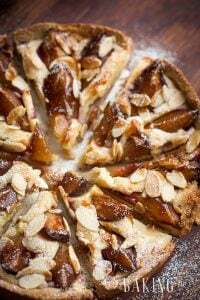 French Almond Cream and Pear Tart – Delicious tart with fresh pears and homemade almond cream. 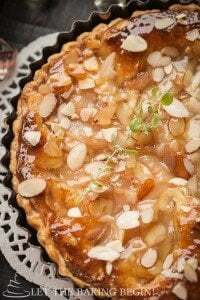 Pear and Almon Cream Tart – Another great tart recipe. Preheat oven to 325F with the baking rack in the middle. Cut the puff pastry dough to the shape of your pan. Prick with a fork every 1/2 inch. Transfer the dough to the tart pan, press against the sides of the pan, trim excess. Transfer to freezer for 30 minutes. Place the tart into the oven and bake for 15 minutes, at 325 F. The dough will still be very pale in color. Then remove the tart and allow to cool. Meanwhile make the almond filling. 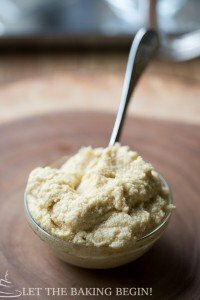 In a bowl of a stand mixer combine the almond flour, butter, eggs, vanilla extract and sugar and whip on high for about 4-5 minutes, or until light pale in color and fluffy. Scrape down the bowl several times throughout. Spoon almond mixture into the cooled tart. Sprinkle with chopped pineapples. Press pineapples down into the filling. Sprinkle with almond slices. Bake for another 30+ minutes at 300F, until the tart is golden in color and puffed in the middle. Remove from oven and allow to cool before serving. Cut each tart into 2 inch slices. STUNNING…Could one use fresh pineapple if dried is not available? Thank you in advance for any enlightenment!! Hmm… I am not sure, I am guessing you could but couldnt’ tell you for sure since I have not done this. Can I use some other driend fruit? In theory you could, but I think it will only be good with something that has a little bit of tartness, otherwise it might be a bit too sweet. 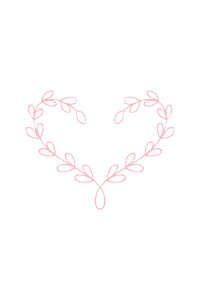 You have one amazing blog! Cannot wait to try these delicious recipes, oh and I also love the photography! Oh… the picture… This Thesis theme stuff is driving me insane, I can only take so many hours of trying to fix it a day. You have no idea how many times I have tried to fix the picture issue but every time to no avail. Finally I found where the editing to that part of the sidebar can be done… It doesn’t help that Thesis comes with no tutorials or manuals…Frustrating.